Bob Moye’s affiliation with Rural Metro Fire began as a fire explorer for Post 453 in 1978 in West Knoxville. Bob became a reserve firefighter in 1982 after starting as a part-time dispatcher the previous year, and his service continues to the present day. Bob was one of the founding members of Rural Metro’s Station 15 in the Cedar Bluff community where he lives with his family. 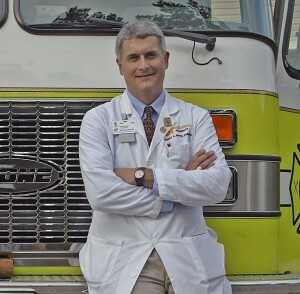 In his full-time profession, Bob is a Doctor of Pharmacy for the University of Tennessee Medical Center, working as both clinician and faculty member. He frequently combines both worlds, conducting classes and in-service training for EMTs and paramedics working for Rural Metro Fire and Rura lMetro EMS in Knoxville.